This is one of the first Old Testament Scriptures that I memorized and twenty plus years after the fact, I am just beginning to understand it. I live in a city of 6000 that is known for a lot of things including Asbury University and Asbury Seminary. In addition, this Mayberryesque village is also known for a crazy traffic intersection affectionately called the “Y’. Now I grew up in Jersey, so I get crazy traffic patterns (do I get an “amen” for the old Airport Circle? ), but this intersection is somewhat of a case study of what not to do in traffic patterns and has remained unaltered although the source of accidents and complaints. The only upside to the “Y” is that it has become the tangible teaching spot for my children as new drivers trying to understand the concept of “yielding” to oncoming traffic. When faced with yielding in traffic for the first time there are various options that a driver could take; they could stop and not proceed because it appears too dangerous and to be paralyzed to accelerate for fear of failing, they could close their eyes and go for it mimicking stunt drivers and seeking the exhilarating rush of narrowly escaping danger if they do, or they could proceed with caution and awareness and give in to the flow of traffic when a space opens up and they ease into that space at the appropriate speed. Interestingly enough it appears that these three options for yielding mirror those taken by three most recent generations as they have encountered entering into the dangerous world of adulthood. Those who sociologists anticipate paralysis to yield are the newest group to be identified – The Homeland Generation, paralyzed by outside fears and threats. These are those currently in pre-school up to Middle School, the oldest of whom will soon hit puberty. The Gen X and Gen Y have already proven themselves to be navigating their entrance in the flow of adulthood as those who would close their eyes and gunning it – throwing caution to the wind. However, it is the Millennials (those currently 15-25 years old) that are most poised for yielding onto and successfully navigating the tricky road of life ahead of them. This generation of “Correctors” not only need to yield appropriately into adulthood, but those who are followers of Jesus find themselves in an apostolic age of great opportunity to affect Kingdom change on earth and to impact many around the world who don’t yet know the love of Jesus but are waiting to see it demonstrated through action and authenticity. In order to flourish in this opportunity, Millenials will need to learn what it means to “yield” to God’s power in the Holy Spirit – like a tree tapping into nourishment deep along the riverbank. It will require a new expression of trust for God’s provision. In many ways this generation of emergents have seen the moral failure and of leaders from many arenas in their lifetime – from business to politics to sports to religion. Consequently their suspicion is raised for human help but there is a clear openness to the unseen mystery of the Spirit of God working in and around them (much of which is fueled by Postmodern deconstruction of the empirical and the tangible.) Nevertheless, yielding is the only way to tap into this invisible source from on high. The best imagery I have seen for yielding like this comes from this scene in Finding Nemo. The result of yielding for a tree is indeed the yielding of fruit. This time of year, at my house, we become visually aware of another kind of yielding. 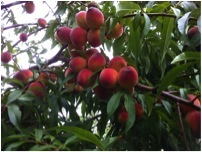 The first Peach Tree that I planted along the side of our house 7 years ago just yielded 12 bags of delicious peaches that we shared with our neighbors (see photo above). The tomato plant that I sunk deep into the soil, fertilized, weeded and watered since St. Patrick’s Day, is yielding the first red tomato. For those in emerging into Missional Leadership, the sooner you realize that yielding to the Holy Spirit will yield a great eternal harvest the better. In many ways, you live in a new day of ministry that is more collaborative, less institutional, more action oriented and less word oriented, and more led by God’s Spirit and less driven by tradition or organizational structure. Therefore it is critical to learn what that means to lean in to the mysterious power from on high and listen to the still small voice and then have the courage to follow. If you do learn to yield into the power from on high, then I guarantee that you will yield spiritual fruit – and it won’t be a minute too soon.